In China, the land of pirated DVDs and fake merchandise, the government's sudden anti-counterfeit campaign may have come as a surprise. 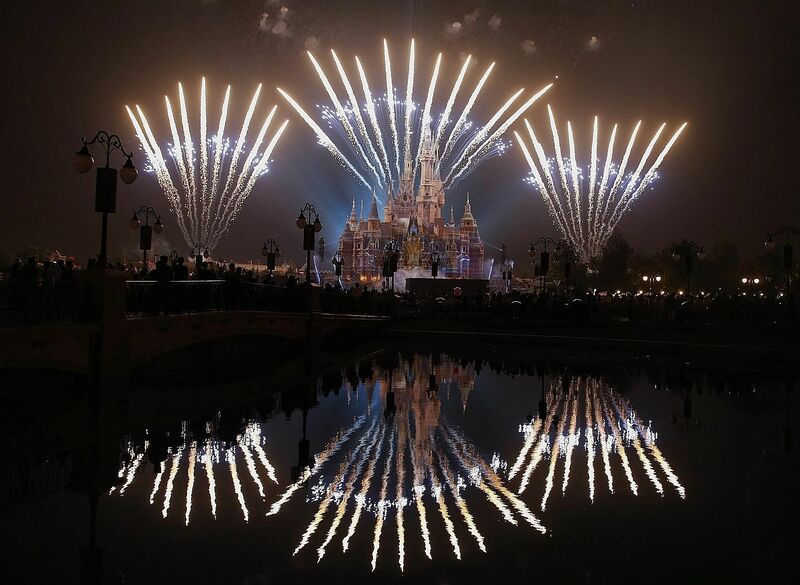 In anticipation of the imminent opening of Disney's theme park in Shanghai, the State Administration for Industry and Commerce has deployed emergency teams to stamp out counterfeit goods both online and on the streets, establishing a 7.8 sq km protection zone surrounding the Shanghai resort to protect Disney's trademarks. To date, five knockoff hotels in the city have already been fined for trademark infringement. Other cities have followed suit. In Hangzhou, some 150km south of Shanghai, the local bureau confiscated a large batch of children's clothing featuring Disney cartoon figures, while Beijing has set up a hotline to encourage reporting of suspected copyright infringement on electronic products, toys, bags and stationery. No doubt such a sweeping crackdown is the first of its kind in the country. Meanwhile, the popularity of Disney has surged to an all-time high. Admission tickets for the theme park are already sold out for the first two weeks after its official opening date on June 16, and the park is expected to draw from the approximately 330 million people living within a three-hour drive or train ride from Shanghai. At the box office, the movie Zootopia has grossed more than US$230 million ( S$317 million) to date in China, and The Jungle Book has taken in about US$150 million. Going by these figures, Mickey Mouse could not be happier - but not so fast. A stern warning has been issued by Mr Wang Jianlin, China's richest man and the chief executive officer of Wanda Group, the largest property developer in the country. "Disney really shouldn't have come to China," he declared, drawing applause from a studio audience during an interview with China Central Television. In 2012, Wanda Group had acquired the United States-based AMC Theatres. Mr Wang now vowed to build 15 to 20 other smaller theme parks across China over the next several years, declaring: "We have a (saying): One tiger is no match for a pack of wolves." Whether a theme park war materialises or not, the real question is whether the latest shield on intellectual property (IP) enjoyed by Disney actually signals a positive change in China's IP regime regarding other international brands. Is the protection of IP rights in China improving, and how should foreign firms proceed? For years, pirated DVDs and fake merchandise have proliferated in China - from Apple watches to LVMH handbags and Nike shoes. If selling genuine products sounds challenging, selling and profiting from digital content is next to impossible. When Disney released the movie Pirates Of The Caribbean: At World's End in 2007, audiences around the world flocked to the cinema for the opening weekend and watched Captain Sao Feng, a Singaporean pirate, lord of the South China Sea, recite a Tang dynasty poem in Cantonese. Audiences across the world were captivated - but in China, however, the government demanded that Disney edit out that poem before the film's local release. Captain Feng's appearance was thus cut to 10 minutes from the 20 minutes in the international version. And while Disney editors were quick to comply with the country's censorship rules, the real Chinese pirates - the DVD pirates - were busy making illegal copies of the international version. By the time of the movie's official release in Shanghai, anyone could have bought the uncensored version from street vendors for about eight yuan (S$1.70) or downloaded the movie for free from unauthorised websites, and the delay of 2½ weeks had decimated the box office returns. The franchise grossed more than US$963 million worldwide, but less than US$20 million of that came from China. According to the State Administration of Radio, Film and Television, box office revenue in the Chinese film industry was worth roughly US$700 million by 2008, whereas the estimated market for pirated DVDs was worth more than US$5 billion. Surely and quietly, however, Disney opened its first English-language centre in Shanghai in 2008, offering instruction to children aged two to 12. Since no child wants more school on the weekend or after the regular school day, Disney strives to make learning fun. Upon entering the school, children are surrounded by a playful world: an oversized Mickey Mouse statue greets them at the entrance, Donald Duck cartoons play on the television in the waiting area, and the Mickey Mouse logo is even carved into the back of every classroom chair. Classes typically run for 45 minutes. The classes for kids aged two to three are taught in both Chinese and English, with the parents in the classroom, whereas children from three to six are taught without their parents being present, and the teaching is focused on encouraging children to speak more in English. For kids aged six to 12, the teaching continues to work on speaking but also incorporates English reading, listening and writing. Between 2008 and 2012, 44 Disney English centres had been built. Parents who would otherwise have bought pirated DVDs are happily paying more than US$1,000 a year for their children's education. Little wonder, then, that Disney English remains a profitable business in the celestial kingdom. From this viewpoint, it is clear why, from Lego to Apple, LVMH and Ikea, foreign firms are building flagship stores in China and, like Disney English, these stores are more than an additional channel. They are the portal to an authentic customer experience - the strongest counterweight to pirated goods. Progress in IP protection can resemble "two steps forward, one step back", despite the latest reprieve on counterfeits enjoyed by Disney. Content distribution is still fraught with uncertainty. DisneyLife - a Mickey Mouse-shaped device that connects to Disney movies, TV shows, music and games through a joint venture with Alibaba - was banned less than five months after it was launched. Disney effectively lost its last hope of building its own content-distribution network. Content alone is never king. That's why, despite the warning from Wanda's Mr Wang, Disney is forging ahead with its Shanghai theme park. In the current environment of China, it is still an immersive experience that wins. • Howard Yu is professor of strategy and innovation at IMD. In 2015, he was featured in Poets & Quants as one of the World's Best 40 Under 40 Business School Professors.